Crosstown Arts is pleased to present Stories On My Back, a large-scale multi-media installation incorporating audio, video, digital photographs, and tamale leaves created by Memphis artist Richard Lou. The installation, never before seen in its entirety in Memphis, is an immersive experience alluding to a ceremonial site where people come to share their stories and personal histories. The piece is informed by stories exchanged through the artist’s family: stories told by the artist’s mother and father, the stories he shared with his children, and the stories retold by his children as their own. 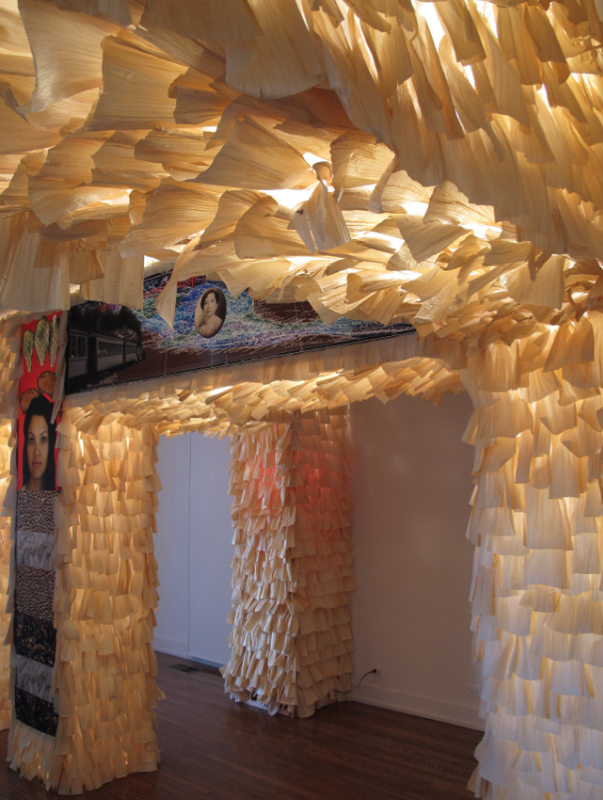 The thousands of tamale leaves in the installation speak to the artist’s bi-cultural heritage as a Chinese/Mexican, or what artist/activist Guillermo Gomez-Peña would a “Chicanese,” a Chicano/Chinese. The stories mix personal history within the larger context of the external historical forces that brought the artist’s families together, or threatened to pull them apart. They are stories of loss, dreams, isolation, ignorance, race, disparities of power, assimilation, spirit, and subjugated knowledge and wisdom. Included in the installation is Lou’s father’s chair, where Lou Yet Ming would sit and watch John Wayne westerns and movies about World War II. Lou’s father served in the U.S. Marine Corp during World War II and was honorably discharged as a Technical Sergeant. Lou Yet Ming’s recliner was re-designed and brought back to life by Louisiana artist Chere Labbe Doiron, reupholstered with images of the artist’s children and his mother. It has traveled with the exhibition for the last two years and now has become an integral component of the larger installation. Richard Lou was born in San Diego, CA and raised in San Diego and Tijuana, BCN, MX. He has over 20 years of teaching experience in higher education, over 15 years of arts administration experience, has curated over 30 exhibitions, and continues to produce and exhibit art while teaching and chairing the Department of Art at the University of Memphis. Crosstown Arts will host a public opening reception for the installation on the evening of Friday, June 5, with food trucks and live music. Dr. Guisela Latorre, professor of art history at Ohio State University, will visit Memphis to give a lecture on Stories On My Back on Saturday, June 6, at 2 pm, which is free and open to the public. Her lecture will be followed by a tour of the installation by the artist. Crosstown Arts thanks the First Tennessee Foundation/ArtsFirst and ArtMemphis for support of this exhibition and its related programs, which are part of an ongoing artistic and community partnership between Crosstown Arts and Centro Cultural. More details about the18-month schedule of collaborative exhibitions and events, and several long-term cultural projects, can be found at crosstownarts.org/centro-cultural-collaboration. Richard Alexander Lou was born in San Diego, CA and raised in San Diego and Tijuana, BCN, MX. Richard grew up in a biracial family, spiritually and intel­lectually guided by an anti-colonialist Chinese father and a culturally affirming Mexicana mother. Educated at Southwestern College, Chula Vista, CA receiving an A.A. in Fine Art in 1981; California State University at Fullerton, CA receiving a B.A. in Fine Art in 1983; Clemson University, Clemson, SC receiving an M.F.A. in Fine Art in 1986. Lou has exhibited at the DePaul Art Museum, Chicago, IL; Wing Luke Museum, Seattle, WA; Landmark Gallery, Texas Tech University, Lubbock, TX; Museo Carrillo Gil, Mexico City DF, Mexico; Museum of Contemporary Art, San Diego; Mexic-Arte Mu­seum, Austin, TX; Newport Harbor Art Museum, Newport Beach, CA; Cornerhouse Art Gallery, Manchester, England; the 3rd International Istanbul Biennial, Istanbul Contemporary Art Museum, Istanbul, Turkey; Dong-A University, Busan, South Korea; Miami Museum, Miami, FL; Museum of Photographic Arts, Balboa Park, San Diego, CA; Walker Art Center, Minneapolis, MN; Mexican Fine Arts Museum, Chicago, IL; Otis School of Art and Design, Otis Gallery, Los Angeles, CA; MIT List Visual Arts Center, Boston, MA; Aperto 90` Section, La Biennale Di Venezia, Venice, Italy; Grey Art Gallery, New York University, NY, NY; Dia Foundation, NY, NY; Artist Space, NY, NY. Richard Lou’s artwork has been published and/or cited in various newspapers, magazines, catalogs, electronic media, and over 30 books. Lou has over 20 years of teaching experience in higher education, over 15 years of arts administration experience, has curated over 30 exhibitions, and continues to produce and exhibit art while teaching and chairing the Department of Art at the University of Memphis. "There has never been a free people, a free country, a real democracy on the face of this Earth. In a city of some 300,000 slaves and 90,000 so called free men, Plato sat down and praised freedom in exquisitely elegant phrases." Lerone Bennett Jr.
As a Chicano artist the recurrent themes are the subjugation of my community by the dominant culture and white privelege. These works manifest themselves in the creation of counter-images and counter-definitions made in a self-determinant manner. As a contemporary image-maker I am interested in collecting dissonant ideas and narratives allowing them to bump into each other, to coax new meanings and possibilities that dismantle the hierarchy of images. The work serves as an ideological, social, political, and cultural matrix from which I understand my place in this world and to make a simple marking of the cultural shifts of my community. The artwork examines how communities use images and language to dehumanize the "Other" in order to ignore the "Other’s" basic human rights. It challenges unquestioned claims to territory and legal status.